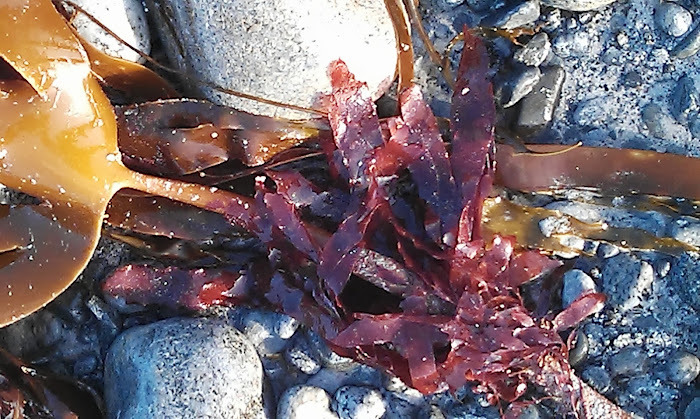 This lovely guest blog is from Helen Westwood, an enthusiastic seaweed cook. Sometime last Summer my husband. David bought me Fiona’s book, “Seaweed in the Kitchen” as a present, which is a lovely book and I found it very intriguing. David had been following Fiona on Twitter and as I was a passionate cook, he thought I might like to try some seaweed cookery! At this point I would point out that I am actually a Welsh girl living in Scotland. I grew up eating Laverbread with my fried breakfast at home which my Dad would buy from the old Cardiff Indoor Market. Then I then later devoured Laverbread in large quantities when I was a University student living in Swansea for 3 years. Swansea Market was brimming with laver bread sellers and it was worth the 1 hour round trip on my trusty Molton Mini Bike to procure this delicacy for my breakfast. It is after all, fondly called “Welsh Caviar”. I just love the stuff! Anyway, back to last Summer. Not long after the book arrived, a strange slightly sticky and pretty strong smelling parcel arrived in the post. The smell initially reminded me of strong French cheese mixed with a hint of trainer socks. I had no idea what hubby had ordered but I opened up the slightly soggy looking parcel to find inside a small sticky takeaway pot containing a bubbling live sourdough culture plus some fresh Hebridean seaweed! Unknown to me, Fiona had offered to send David some of her very own unique sourdough starter culture which she called “Hotchpotch”, only because it contained a real hotchpotch of several seaweed species (added for flavour). “It’s so you can make some sourdough bread”, hubby explained with a boyish grin, as he loves me cooking for him…..and so my exploration of seaweed cookery began! I lovingly cultivated the sourdough culture in a jar in my kitchen and called my culture “Dave” after my husband, as it’s apparently customary to name your sourdough starter. It became more of a pet and part of our family. I would feed it regularly, stir it and check daily to make sure I hadn’t killed it. I had a few disasters too after overfeeding and it just exploded all over my kitchen worktop but enough said about that! I have to say that my first few seaweed sourdough loaves were pretty brick- like. David also ordered me some pots of Mara Seaweed and some other freshly dried seaweed from another company called “Just Seaweed” who are based on Bute. I was using Fiona’s original starter to make my own bread all from natural yeast in the culture and adding the dried seaweed for flavour. I soon realised how much seaweed I could add to my bread dough, as one loaf contained so much dried seaweed that the dough was quite gelatinous and the actual loaf very sticky. Not to be easily defeated (and I hate food waste! ), I just sliced it and dried out the sticky pieces in my oven then “ Voila!” , Seaweed Sourdough Biscotti was invented. It tasted fab with hunks of cheese! I made many successful sourdough loaves after that, some containing seaweed , some with herbs, garlic, olives and even dried fruit. I also took my sourdough starter to France on holiday with me twice as it was behaving better and cooked sourdough loaves on holiday using French flour which tasted blooming lovely! Several months into my “Seaweed Discovery”, I got talking to “Dr Seaweed” (Craig Rose) on Twitter who sent me some of his powdered dried seaweed to experiment with and I developed a few new recipes using this, including homemade “Seaweed Fried Chicken!”. It’s pretty easy to make and tasted delicious! I used pieces of chicken breast dipped in a buttermilk and egg mixture, then flour mixed with dried seaweed, paprika, chilli, garlic powder and a few other mixed herbs. Then I dipped the nuggets back into the buttermilk mix plus one final coating of the seaweed flour mix. 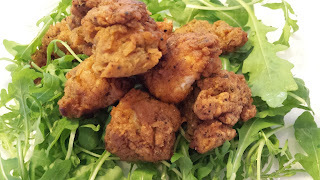 The coated nuggets were deep or shallow fried and tasted amazing! I quickly realised that seaweed is not only a fabulous flavour enhancer without all the health worries associated with MSG or salt but also a great flavour in it’s own right. I also made a successful batch of oat cakes with added dried seaweed, inspired by one of Fiona’s recipes and my Homemade Thai fish cakes tasted wonderful with dried seaweed added to fish, mashed potato and Thai curry paste. I also love to sprinkle dried Seaweed liberally all over my fried or boiled eggs most mornings as it just tastes wonderful, adding a great Umami flavour. Up to that point, I was really cooking mostly with dried seaweed. Then, while travelling in the Inner Hebrides with David, Mum and Dad, I began to forage for my own fresh stuff! After carefully studying an identification book, I managed to source some fresh Sea Lettuce on a stunning beach called the Singing Sands on Islay. I waded out in my bikini at low tide and grabbed a small handful, carefully harvested from one of the rocks, making sure I didn’t take too much or pull out the roots. I think Sea Lettuce was the one I could identify with confidence and initially felt safe I wasn’t going to poison anyone! My Dad was amused up to the point when I told him I was going to cook the seaweed for his dinner in a risotto! He’s very much old school and is always suspicious of anything new. 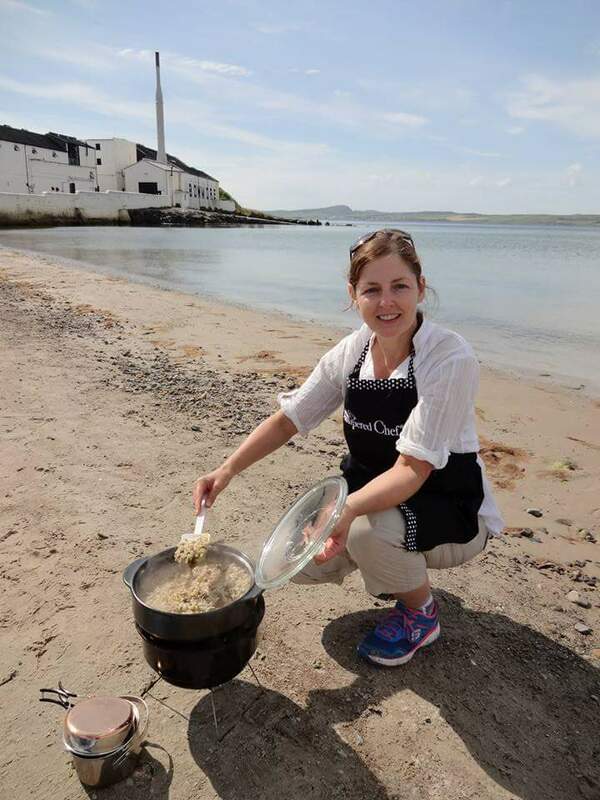 I managed to overcome his initial hesitancy by offering to cook the dish on the beach in front of Bowmore Distillery and would even slug some of their whisky into the recipe. He perked up a bit at this point! So we set up hubby’s mini BBQ and my cooking pot on the beach at Bowmore Distillery and I cooked the most amazing Mushroom and Sea Lettuce risotto with cream cheese, herbs and garlic. Just towards the end I slugged in the glug of the Bowmore Whisky and served it up to my hubby and parents. Needless to say, it tasted delicious and we ate the whole damn lot! For experienced foragers, seaweed is the new caviar but it goes without saying, only pick and eat what you can identify with strong confidence. For nervous cooks and novices, then you can’t go wrong with a few canisters of Mara Seaweed on your dining table to use like a condiment on your food or just check out your local supermarket or health shop for seaweed products. Seaweed is a great salt alternative, a natural flavour enhancer and has a lovely savoury taste when added to your cooking. However, if you really want to grow hairs on your chest (as they say in Wales! ), then my favourite serving suggestions is still a large dollop of Welsh Laverbread, fried in oatmeal and served up with bacon, eggs , tomatoes and mushrooms for breakfast. As someone once said to me, “You can take the girl out of Wales but you can’t take Wales out of the girl!”.